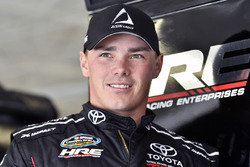 Brett Moffitt was an unhappy camper following Friday night’s Stratosphere 200 NASCAR Camping World Truck Series race. Despite being passed for the win in the late going by Monster Energy NASCAR Cup Series invader Kyle Busch, Moffitt expressed no animosity toward either Busch or the NASCAR policy that allows Cup regulars to drop down and compete in the Xfinity and Truck Series. Moffitt’s unhappiness stemmed from difficulty navigating lapped traffic in the closing laps, including a door-banging session with Michel Disdier that allowed Busch to slip past and claim the lead. Moffitt’s unhappiness stemmed from a pair of scuffles with lapped cars in the final 25 laps. The first involved Myatt Snider – who had just returned to the track after serving a pit road penalty and falling two laps down -- and Michel Disdier, who banged doors with the leader while being lapped. Moffitt (16) hounded Busch to the finish. 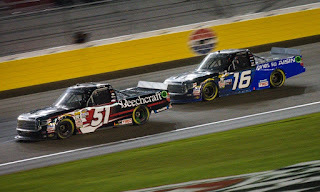 Moffitt’s bid to regain the lead ended when Norm Benning – multiple laps down after being black-flagged by NASCAR for failing to maintain minimum speed earlier in the evening – crowded the runner-up’s line and broke his momentum. “It’s frustrating because when you’re out of the race, you shouldn’t get in the way of the leaders,” said Moffitt, who locked himself into the NCWTS playoffs with a win two weeks ago at Atlanta Motor Speedway. “It’s just a bittersweet race. While Moffitt’s anger is understandable, incidents like those experienced Friday night are not uncommon in the Camping World Truck Series. As the lowest of NASCAR’s three national divisions, the Truck Series attracts drivers with less big-track experience than their Xfinity or Monster Energy brethren. At your local short track, the closing rate between leaders and lapped cars is relatively low. On a smoking-fast half mile like Las Vegas Motor Speedway, however, the difference between the “haves” and “have nots” can be as much as 20 mph. Combined with a lack of experience, those sky-high closing rates can (and do) result in some anxious moments for race leaders; some of whom are also relatively low on the experience ladder. In the aftermath of Friday night’s race, it would be easy to overreact. Some observers have done exactly that, calling upon NASCAR to black-flag all lapped machines with 20 laps to go, clearing the field for race leaders to compete unimpeded for the win. Others have advocated for the sanctioning body to immediately disqualify any vehicle unable to maintain minimum speed; parking them for the day after a single infraction. At the end of the day, however, no major changes are needed. Part of learning to race at the highest levels of the sport is learning how to deal with lapped traffic, and how to conduct oneself as a lapped vehicle. Those skills don’t come from a rulebook. They are learned firsthand, on the race track. And sometimes, mistakes are the best teacher. Did the lapped traffic not pose the same problem to Kyle Busch or did they just get out of the way because of who he is? Lapped traffic has been reality from Day One of racing. Moffitt (once in that same spot earlier in his career) didn't handle traffic as well as he should have - or as Kyle Busch seemed to do.